When we took up residence here there was one aspect of the Homestead location that caused us a little concern: the front fence bus stop. We quickly found, however, if we looked after it then people followed suit. It’s not an arduous task: a quick shufti after dropping Farm Girl off at the Kingdom of Nova, some attention from neighbours Alan and Josie ‘s lawn mower once in a while, and a squirt with the hose now and then keeps it looking like a nice place to hang out until the next bus arrives. But two of our actions really changed the way “our” bus stop was treated. The first was replacing the old, paling fence with a see-through railing one, and the second: resurrecting the garden. Today was warm but overcast and as such the perfect day to give the only Homestead garden heavy on the aesthetics some TLC. This task is never dull; you just never know who’s going to wander past as you work your way along, hauling out the couch grass, dandelions and, today at least, four Steinlager bottles. While gingerly negotiating the Karakaberry, contemplating the difference between thorns and prickles, our attention was attracted by a lady keen to know the identity of that very plant. Information was imparted, the fledgling fruit and fence covering ability admired and we suddenly knew we had found a more deserving recipient of the cutting flourishing in the glasshouse than the dastardly berry filcher. A very pleasant ten minutes was spent discussing everything and nothing until we Homesteaders waved the bus off with cheery smiles and names exchanged (along with the promise of the aforementioned plant’s delivery to it’s new home, just around the corner, by the time our new friend, Anne, arrived home from her shopping trip). All that remained to be done was a quick trim of the rampant daisies when the next prospective bus patron arrived. As we were effectively rummaging around her feet, a throw away comment was offered by way of a conversation opener. Nothing. The Renovator mimed this visitor was plugged into their music, obviously they were wanting to be left alone but it was a little awkward.. As we snipped and swept and yakked inanely not half a metre from this visitor, there was not a flicker of interest or an inkling of acknowledgement. “Have a nice day,” The Goat Herd called, just a little sarcastically, as our companion finally boarded the bus. The art of conversation, you either have it or you don’t. 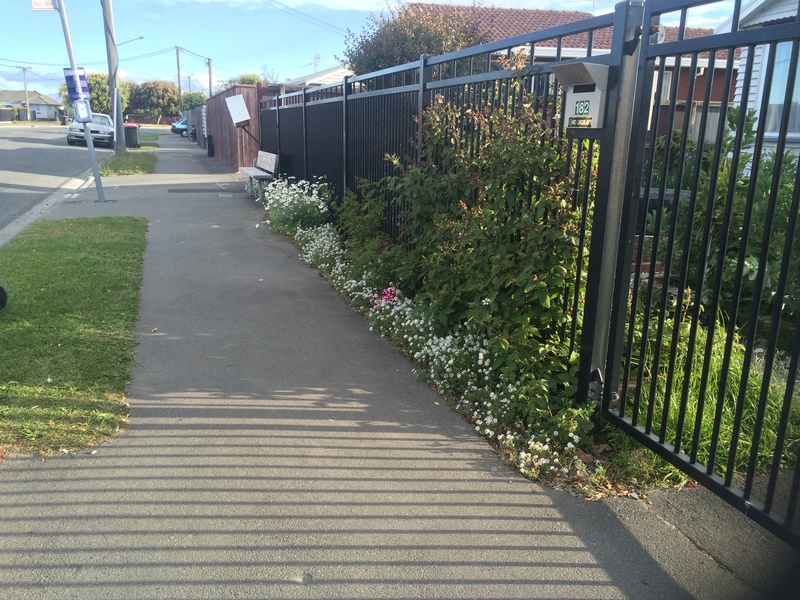 This entry was posted in community, Garden, Union Homestead and tagged Aotearoa, Christchurch, communities, Community, conversation, conversations, garden, gardening, headphones, Karakaberry, modern society, NaBloPoMo, New Brighton, New Zealand, Otautahi, society, talking. Bookmark the permalink. But I do love those plants and flowers peeping through your fence! The observant people waiting at the bus stop must enjoy the results of your endeavours. I hate people who live in their own bubble and never interact with the rest of the world. I am a great picker-up of rubbish and cannot understand the folk who just walk past and over it as if it wasn’t there. It astounds me how insular people can be and yet, should their cellphone ring, they are quite happy to carry on the most intimate of conversations at full volume. The garden is not the most beautiful, consisting of very hardy plants, but they put on a good show and remind people that people care about the space. I’m constantly being fooled by hubby walking toward the house from the car, home from work, and thinking he is talking to me in a lovely so nice to see you after a long day sort of way, but no…he’s talking to his phone, for which he has an ear piece thingy. I can and do converse with pretty much anybody, and it’s amazing what can come out of seemingly very casual contacts. I wasn’t always so chatty, though. As a teenager, I was incredibly shy (my children do not believe this), completely silent at social functions and would most certainly have avoided any contact with strange people at the bus stop. My grandmother took me in hand and pretty much forcibly trained me in being socially correct (you can just tell from that what level of society she felt herself to belong to), and I have to say that I thank her in my heart daily as a result, much though I hated it at the time. I would not have my job, still less enjoy it, if I was not comfortable chatting with strangers of all walks. I would find waiting rooms very dull, intermissions excruciating, and funerals much worse than they already are. I look forward to my Thursday mornings at the school and the chance to banter with teenagers who have not had breakfast yet (maybe that shows a sadistic side to my nature…), and I can even manage my husband’s office Christmas party without tugging on his sleeve begging to go after an hour. Like your neigbhourliness post of yesterday, I think the art of conversation is not so much about “what’s in it for me”, so much as if it comes from a place of generosity and genuine interest in the other person(doesn’t have to be deep, just genuine), then that’s when conversations can develop into plant exchanges, egg exchanges, bales of straw, playdates, cups of tea and friendship. Those with earbuds and bluetooths lose out in my opinion. I think we had very similar grandmothers 🙂 I too was shy and likewise my kids snort in disbelief when I share this. Those ear piece phones…I am constantly being fooled by them. I will overlook your “strange people at the bus stop” comment…sigh…:) and nod frenetically in agreement regarding the whole “what’s in it for me”. If I’m being brutally honest, I just love having a good old chinwag. Litter picking is a lifetime’s work. How nice, it’s become too commonplace today for people to want to keep their heads down and not be bothered, but what a beautiful world it is when we can exchange such simple pleasantries. Thank you for the reminder! Well done you for keeping the bus stop so nice! I was at a train station the other day and asked a lady sitting on a bench where to catch a certain train, she actually tutted and removed her earphones to reply ” What?” and frowned! I feel her music must’ve been very important that day!